Many people come to us wanting to update their kitchen or bathroom. The reasons are always different, but the experience is similar. While it’s easy to see the end of the process through reviews, it is a lot tougher to know what the whole process is like. We recently worked with some people on a kitchen remodel and asked them to help define the process from start to finish. While countertops are usually what people notice when looking at a remodeled kitchen, cabinets are also a part of the mix and that’s where Designer Cabinets, Granite & Tile came in. The selection of cabinets can always be dicey if you don’t know exactly what you’re looking at. This is the area where Hannah matched her expertise with what TJ & Joyce wanted. The combination of countertop and cabinet came together well. In the end, TJ & Joyce got exactly what they were looking for. They got a kitchen that’s the envy of the neighborhood and used it to put the house up for sale. Their reaction when they first saw the finished project was brief but powerful. “Wow. It was all we could say,” said TJ. When asked if they would work with both companies again, TJ didn’t hesitate. He had another project in mind and he, Joyce and Hannah sat down and started planning again. 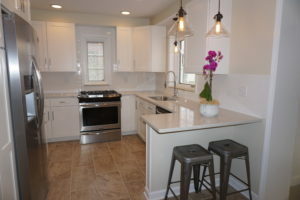 As you think about your bathroom or kitchen project, let us show you how easy it can be to realize your dreams, whether it means putting together your dream kitchen or bathroom or flipping a house. Contact us today and get the process started.